Why does Word sometimes override bold and italics when I change a style? If you need to change the style of your text but have added direct formatting to it; bold text or italic text, beware! MS Word can really mess it up. 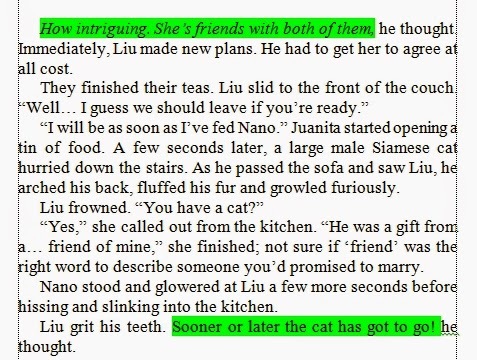 Using ‘Normal’ style, copy these two paragraphs of text into MS Word. Make this first paragraph italic. Using Normal style, copy these two paragraphs of text into MS Word. In this second paragraph make just the last word italic. Now select the first paragraph and change its style. I’m going to make it, my style of ‘No Indent’. Now select the second paragraph and change its style. Again change it to ‘No Indent’. Notice what happens to the italics? The same thing happens for any other direct formatting you apply whether it’s a font, a font size, bold, italics, color… whatever. 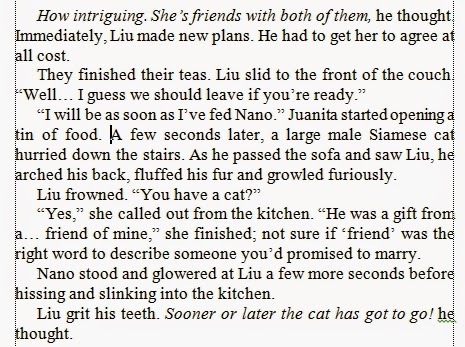 Apparently the rule is meant to be that if a paragraph has less than 50% of direct formatting then this will be retained if the style is changed. If it has more than 50% then the direct formatting is lost. Select more than one paragraph and all the direct formatting is changed. …but even that is not consistent! If you have a document with multiple styles and you wish to change just one of them, then right clicking the style, selecting all X instance(s) and then changing the selected items may give you either effect. 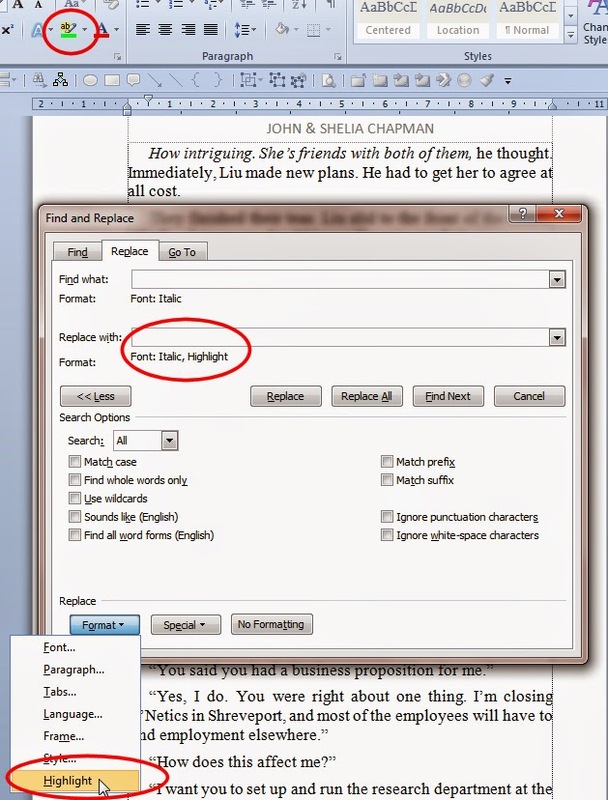 Use Format > Font and select ‘Italic’ in both the find and replace boxes. Select green highlighting from the home toolbar. Step 2 – Select all instances of the style you want to change and change them to the new style. Some of the italics will be lost but the green highlighting will remain. Step 3 Use the replace menu to find all instances of green highlighting and replace them with italics and no highlighting. 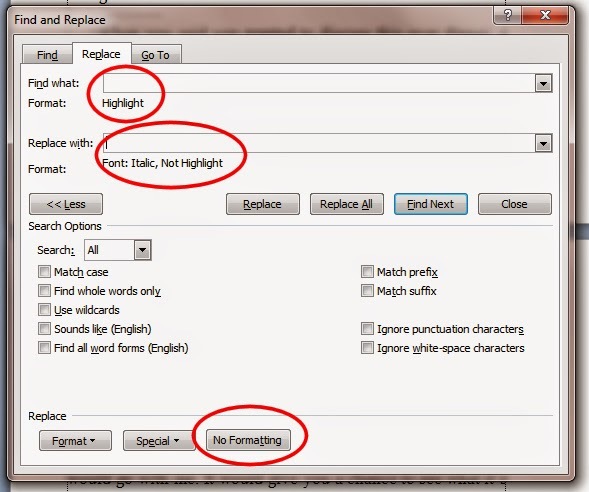 Once you have used ‘Replace All’, your style will be changed and the italics back to normal. 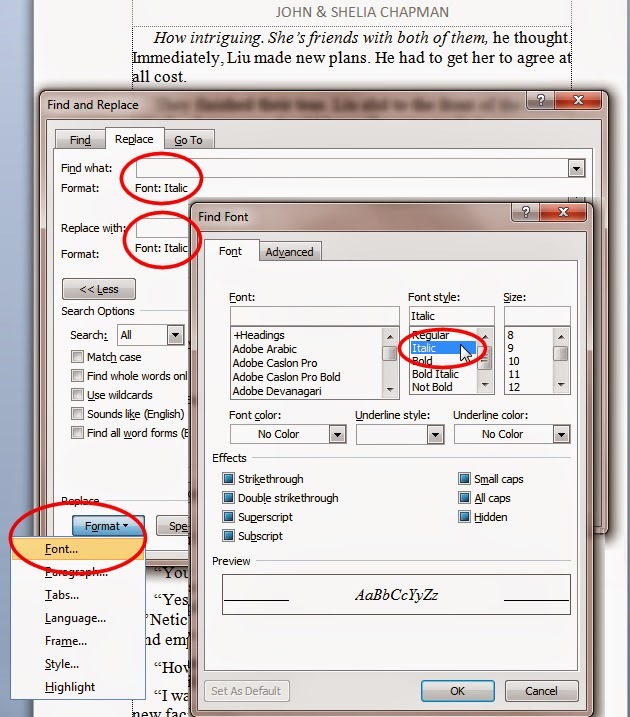 This method can be used if you’ve used bold, colored or any other direct formatting within a style. You might want to use a different highlight color for each. ← What can publishers do next? 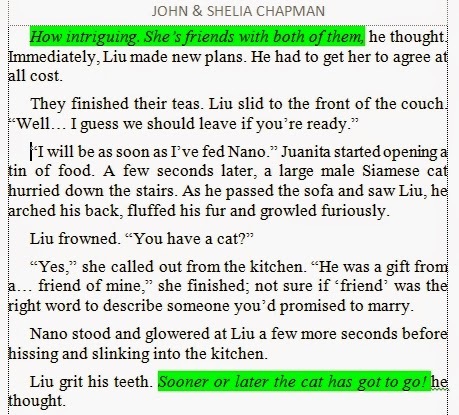 I wrote a manuscript, i checked the manuscript before submitting it to an ebook book hosting site.But i found out that in this ebook website, some of my sentences are bolded, which was not the case in the original document in word. PLease, i have a question. I have been battling with it for days, what should i do?